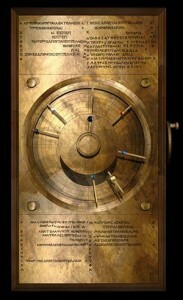 I watched an interesting documentary on the Antikythera mechanism yesterday. You’ll probably be aware of its existence as a corroded, but obviously complex, artifact retrieved from an ancient shipwreck a century ago. Within my own memory, it was an obscure object that raised the mystery of whether ancient Greeks could really have produced such a sophisticated geared mechanism, or whether it was recent, or alien. Now, through modern technology and some really hard work, its function is now known in some detail, and its inscriptions deciphered. It is an astronomical machine, possibly originally with 60 gears, which certainly predicts the movements of sun and moon and lunar and solar eclipses, and in all probability, originally, the movements of the five known planets as well. This discovery serves to rehabilitate a description of such a machine developed by Archimedes as history, rather than legend. On the face of it the reconstruction of this astonishing accomplishment confirms the common atheist belief that science was alive and well under the Greeks, but went into eclipse with the Dark Ages (aka Christianity) until secular Enlightenment scientists revived it. Or, more simply, science gave us the ability to predict eclipses, but religion predicts nothing. This version of science history has been thoroughly debunked (eg by James Hannam), but there are a couple of other points of interest, that may be relevant to the state and agenda of modern science. The second is that all the effort that went into the Antikythera object built on many centuries of previous observations and calculations, primarily by the Babylonians (whose knowledge spread to the Greek world much later). Both Babylonian and Greek mathematicians were serving not pure knowledge, nor practical Baconian science, but the useful business of divination through astrology. Particularly amongst the Greeks, astrology straddled the boundary between religion and magic: either the signs in the skies told how the gods were disposed, or what happened in the heavens had a causal relationship with earthly events. There’s not much difference between the two, since the heavens were the realm of the gods anyway, with a life and purpose of their own. In either case, though, the agenda was not materialism but spiritual metaphysics, aimed at enabling people to live successfully in harmony with the cosmos and its meaning. So the mechanism is yet another indicator that science can live quite comfortably with teleology when naturalistic blinkers are removed. The third point is that the Antikythera mechanism, based on pre-Ptolomeic, let alone pre-Copernican, geocentricism, shows how robust and scientific the older astronomy actually was. If you could build a machine that would reproduce the movements of the spheres centuries in advance, then it was certainly not unreasonable to suppose that the contrivance was a reasonable representation of celestial mechanics. TOF’s series has somewhat to say about the way that metaphysical preferences preceded adequate empirical data by many years in determining whether individuals leaned towards geocentrism or heliocentrism. Arguably it was humanistic metaphysics that swung the pendulum in favour of the latter well before the scientific case was settled. The Renaissance, whose ethos had revived astrology and had by no means abandoned it by Galileo’s time, also preferred heliocentrism because it meant earth was no longer a lowly realm, but a celestial one. Interestingly the church opposed Galileo’s astrological fatalism as much as his supposedly heretical heliocentrism. Even now, of course, science is always significantly underdetermined by the data. That is certainly true of evolution. It makes some predictions, but hardly exhaustive ones – not nearly as exhaustive or exact as the geocentric Antikythera mechanism. Indeed it is notorious for being, apparently, capable of accommodating any data whatsoever, and saying retrospectively that the findings are exactly what you would expect under natural selection. A truly theistic account of life is still completely viable – provided one does not accept the materialist metaphysics that underpins Darwinism. Perhaps our modern certainty is partly based on the glitter of our technology. If you were the wealthy and aristocratic owner of such an advanced and hugely expensive piece of kit as the Antikythera planetarium, how open would you be to the idea that not only was the astrology for which it was built baseless, but its view of the universe was inside out. How could that be true when the truth is sitting before you in solid brass – and it works?